We offer preparing cars for motor sports: raids, long-distance rallies and races Due to our experience in working with old cars, we can offer adaptation of car to sport as well as building a special car for sport or a special event. In case of several models our offer include building of new aluminium bodies. 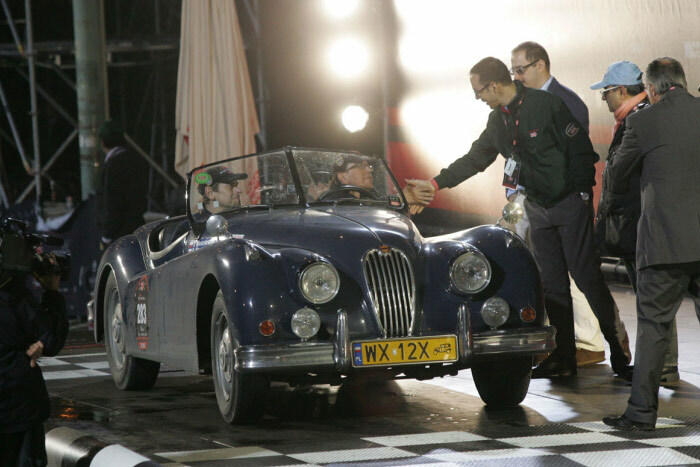 The most interesting and exciting was the comprehensive restoration and preparation of Jaguar XK150 FHC for the Paris – Peking rally in 2013. 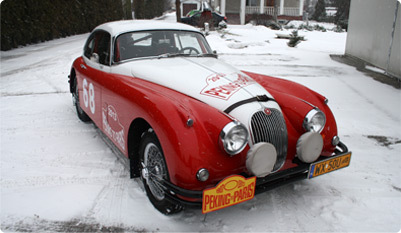 ( http://www.endurorally.com/pages/5th-peking-to-paris-rally-2013 ). This rally is an unusual test of the driver’s and machine’s endurance. It goes across seven countries, the trail counts for almost 13 thousand kilometres. The contestants have to face the Gobi desert, deserted areas of Siberia, infernal tiredness and unpredictable weather conditions. The first raid was held in 1907. In 2013, the Polish team stood for the first time at the starting line. We started by strengthening the frame and fixing suspension. Several accidents were known to take place, where during the raids in Jaguar XK150, the suspension escaped back silentblocks. It was necessary to fix those construction points properly, those which were exposed to the greatest overload. Let’s ford rivers! During the entire process some information came to us concerning next challenges the Jaguar would have to face. It turned out that there is a possibility to ford rivers by drivers. The water would reach one metre. There is no way as to find solutions for this contest. We decided to uplift the whole car. We ordered special Bilstein shock absorbers equipped with springs. When we told the engineers of Bilstein about our car renovation, they were willing to work as passionately as us. The outcome of their work turned out to be great. Not only was the car lifted up to 20 centimetres but also we were able to regulate the height of the suspension. To be completely sure about the reliability of the whole construction, we ordered special torsion bars made with airway steel. The uplifting bodies weren’t the only success achieved by modifications presented above. The main effect of our works was to obtain maximum endurance of suspension. Through the strengthening of the construction, shock absorbers, consolidated leaf springs and extremely durable torsion bars we could sleep well. If the torsion bars let us down, the car would carry on thanks to the spring. If the springs let us down, bars would uphold the Jaguar in midair. The similar case concerns the back suspension. If the car is to immerse in the water, the all bleeds of units should be led this way to avoid the possibility of flooding them. Therefore bleeding of the gearbox of back bridge and engine was incorporated up to upper edge of engine’s chamber. The electric wire was properly modified and secured. The Jaguar was given many electric appliances, very power-consuming. In any case we used a modern and efficient alternator. The device was designed to look like the original dynamo. The next requirement to meet was enlarging fuel tanks. Almost 700 kilometres to ride without a possibility of fuelling made us create a sixty-litre tank, made of aluminium, reinforced with fiberglass and kevlar. In case of fuel we decided to act in two different ways. Enlarging of the tank led to increasing the car’s reach, but still there was a insufficiency. We decided to set up five-speed gearbox. The original four-speed gearbox never was a perfect solution for the 200 – horsepower Jaguar. Not precise and loud must find a place at home. The fifth gear increased the comfort of journey and caused the engine to gain the possibility to work at lower rpm at the same speed as a four-speed gearbox. To avoid a situation where the fault could foil the skid artists plans, we rebuild the energizing system. We equipped the Jaguar with two additional fuel pumps, and the original one was turned into an electronic version. While designing the brake system we focused on reliability and effectiveness. We decided to install a dual-circuit system and pedalbox. The greatest asset gives a possibility to carry on the ride even if the system is damaged at the front or the back. A more ergonomic system of pedals ( brakes and clutch) make an long-hour ride a pleasure. We also used new four-piston, aluminium brake calipers at the front and modern brakes pistols at the back. All elastic brakes wires were replaced with harder ones in an aluminium braid. The Jaguar constructors did a great job. The truth is that apart from installing several modifications in that car there is nothing to change. The engine was completely modernised, treatment was made, modern and fireproof pistons of the Mahle company were installed along with modern sealings and oil filter conversion (great facility during replacing the fuel on the road) We installed starters, an electronic ignition device and enhanced high-tension wires. A K&B air filter was installed as high as it was possible. The ride across the desert required additional changes. We modified the bleeding system, the core of the radiator was selected this way to bring the heating. We installed an additional electronic ventilator. And what about the crew ? At every cost, we wanted to sustain the original character of the car’s interior, which we mostly succeeded in. 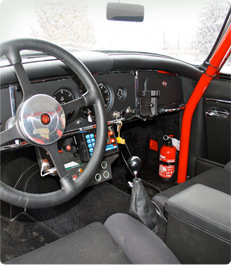 Several smaller corrections required installing a safety cage and offroad car seats, which thanks to the commitment of the company – Expedition 4×4 was possible to import (http://www.wyprawa4x4.pl/?file=kontakt.html ). Yet let’s start from the beginning. Before we got to padding assembly, we built a safety cage, giving the guarantee of safety and similar to the old one. When the moment of padding covering came, we soundproofed the car’s interior and insulaed it thermally. After assembling most of elements, it was high time for car’s seat assembly and an additional centre console (additional switchers and fixings for navigation and measure appliances) The rest of padding was made with black leather on the base of original patterns. When all units were assembled in a car there is a high time to secure the bodywork and chassis. We decided to assemble new tubular bumpers both at the front and at the back. The matter seemed to be easy. However, it turned out that pipes with the right efficiency and cross-section had to be imported from Germany. We the bumpers to remind the shape of originally chrome-plated bumpers. The next problem occurred when we wanted pipes to secure the bodywork and cambered them. The company EL_JAKO came forward importing the machine able to camber material accordingly to our drafts. At the front bumper, we installed long-distance reflectors, on which our upholsterer sewed slipcovers accordingly to drafts of epoch. At the back bumper, we installed the boot for two spare wheels and additional indicators. However what is most interesting was placed under the car. The whole chassis was secured with special covers made from Israeli steel from light fuses. There was a great adventure working on this project, we could finish off this project thanks to help and kindness of many people. We would keep our fingers crossed. The most interesting project was renovation and preparing Jaguar XK 140 for one of the most prestigious car rallies all over the world. 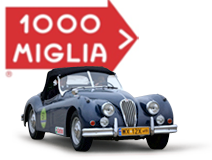 Mille Miglia has been organised since 1927. It was held through roads of Lombardy and Tuscany on the Brescia-Rome-Brescia way. „ Thousand-Mile Rally“ is dominated by classic models of the most sophisticated European car producers. In the event the famous drivers took place, the nobility representatives and business representatives. Along with a sport event Mille Miglia is also a social event. In 2010 for the first time Tadeusz Wesołowski – driver and Paweł Nawrocki – pilot took part in this event. One of rules during the raid is to maintain 100% originality of car. No corrections, modifications, the car must be the same as if it has left the factory. The technical committee that performs an inspection before the rally is famous for its tenacity. Nothing would slip the attention of meticulous Italians. The smallest fault would result in exclusion from the event. Therefore we had no choice, despite the willingness to improve unreliable brakes, replacing the gearbox with a modern one or replacing tin rims with radial ones. We got to work with passion. Every element was repaired and painted and assembled in a car. Renovation took almost a year. All replaced parts, of those production was finished and the offer of company concerning the revolution of parts were insufficient, so that they were manually remade on the base of original one. Even wheels, despite many faults in comparison to contemporary ones, were as selected so as to make the shape and pattern of tread consistent with the original one. We download the certification of originality of car to get to know all details regarding coloring. The car was painted as it was for the first time fifty years ago. The same procedure concerns the padding. 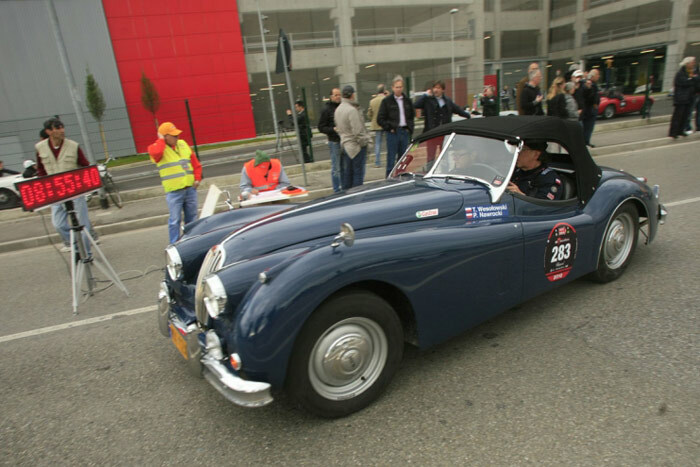 The final effect of our work was a beautiful Jaguar XK140 which not only lets Polish people return for the legendary raid, but also enriches other sport events. The car is seen on raids of Coppa Milano-Sanremo Rally and the Rallye des Alpes.